To the ancient Celts, Samhain was seen as a time when the veil between our world and the Otherworld was thinnest. A time when the 'door' to the Realm of the Dead opened enough for the souls of the dead, and other beings, to come into our world. 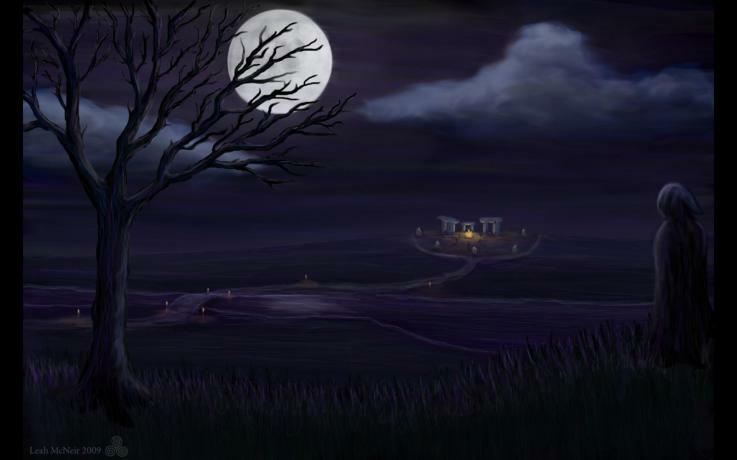 Feasts were had, at which the souls of dead clan & kin were beckoned to attend and a place set at the table for them. As such, Samhain has been likened to a festival of the dead, held by many cultures throughout the world in honor or recognition of deceased members of the community. During the night of this great autumn festival, people took steps to protect themselves from harmful spirits, which is thought to have led to the custom of guising. In Scotland and Ireland, "guising" or children going from house to house in disguise… was integral to festivities... a gift in the form of food, usually apples or nuts or sometimes coins was given out to the children dressed up in costume. Those in disguise are only supposed to receive treats if they perform for the households they go to. This normally takes the form of singing a song or reciting a joke or a funny poem which the child has memorized before setting out. Guising and the wearing of masks may have been another way to befuddle, ward-off or represent the harmful spirits and fairies. Although guising or mumming was common at winter festivals in general, it was particularly appropriate on a night in which supernatural beings were said to be abroad. For the reveling highlanders, it was a very short step from guising or representing harmful spirits and fairies… to playing pranks. 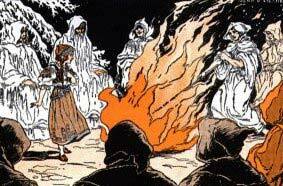 Playing pranks at Samhain is recorded in Scotland as far back as 1736 and was also common in Ireland, which led to Samhain being nicknamed "Mischief Night" in the highlands. Divination was an essential function of Samhain. Harvested foods such as apples and nuts were incorporated within the divination ritual. Apples were peeled, the peel tossed over the shoulder, and its shape examined to see if it revealed a potential spouse. Nuts were roasted on the hearth and their behavior interpreted. If the nuts stayed together, so would the couple. Egg whites were dropped in water, and the shapes foretold the number of future children. Ravens or crows were sought out and observed. The number of birds or the direction they flew would divine these most important questions of matrimony and/or child bearing. These familial questions were crucial for the survival of the clan. Matrimony brought with it alliances within the clans, while the birth rate directly influenced a clan’s strength through numbers. Questions of divination and prophecy traditionally fall to a culture’s shamans. The ancient Celtic shamanic traditions were overseen by a spiritual tradition known as Druidism. Virtually nothing is known concerning the practices of the ancient Druids, so that… although they certainly existed… they function more or less as legendary figures. Historical reports from the Roman occupation era indicated that the druids followed the Pythagorean doctrine… essentially the immortality and transmigration of the soul. Scottish folklorist Donald A. Mackenzie theorized that druidic philosophy and cosmology was influenced by Buddhist missionaries who had been sent by the Indian king Ashoka. This theory was based in part on archeological artifacts such as the Gundestrup bowl, on which the Celtic god, Cernunnos, is postured like a typical Buddha. The Druids did not believe in eternal damnation, or in the angry demiurgic god who rejoiced in torturing sinful heretics and infidels. The thought-control apparatus of the Roman Empire and Roman Catholic church could not operate in the Celtic lands of Britain, Ireland or Scotland as long as Druidical vestiges remained. It's also apparent that the only religion existing to the present day which resembles Druidism is Buddhism. The metaphysical bases of Buddhism and Druidism are very similar. Buddhist teachings on Dependent Relationship indicate that all phenomena exist in three fundamental ways. First, phenomena exist by dependence upon causes and conditions. Second, phenomena depend upon the relationship of the whole to its parts and attributes. Third, and most profoundly, phenomena depend upon mental imputation, attribution, or designation. According to John Michael Greer, Druid philosophy has a similar division into three 'elements' which are known in old Welsh as Gwyar (change or causality), Calas (structure) and Nwyfre (consciousness). Wicca, Neo-Paganism and Neo-Druidism mark a popular return to the old ways. Popularized by Gerald Gardner, Wicca draws upon a diverse set of ancient pagan motifs for its theological structure and ritual practice. Wicca is primarily a duo-theistic religion, centered upon the worship of a Moon Goddess and a Horned God. The Goddess and the God may be regarded as the Divine Feminine and the Divine Masculine. They are complementary opposites, similar to the ideas of yin and yang in Taoism. Neo-paganism emerged as part of the counter-culture, New Age and Hippie movements in the 1960s to 1970s. Inspired by the wider occult movement, neo-paganism incorporates Neo-shamanism, or a revival of an old form of "shamanism", a system that comprises a range of beliefs and practices related to communication with the spirit world. Neo-Paganism emphasises the sanctity of the Earth and Nature. The related Eco-paganism is an off-shoot of direct action environmentalism, with a strong emphasis on fairy imagery and a belief in the possibility of intercession by the Fae… or fairies, pixies, gnomes, elves, and other spirits of nature and the Otherworld. Neo-Druidism forms the second largest pagan practice, after Wicca. Like the name implies, it draws inspirations from the ancient Druids and ancient pagan Celts. Many forms of neo-druidism are seen as philosophies that are not necessarily religious in nature. The most appealing shared aspect of Wicca, Neo-Paganism and Neo-Druidism… is, of course, the festival. Most revelers follow eight festivals a year, which are collectively organized and known as the Wheel of the Year. What self-respecting pagan wouldn’t see it as their sacred duty to observe these ancient and now revived festivals? Festivities aside, we are drawn to the synchronistic aspect of the eight fold organization built in to this pagan revival. The Buddhist/Druidic connection only reinforces the universal nature of the eight-fold and eight-circuit model of consciousness. The underlying octave structure apparent in universe continues to surface in the world’s great philosophies… and that is a reassuring thought. Hey Tek Gnostics a rebel yell at you!!! The secret sun is painfully defunct. Now is the time for Chris Knowles fans to suscribe here.! You are spot on in your evolvement and intelligence. The Secret sun is taking a break, but by no means are we synchromystics allowed to fade away! This means of transmission is key. Dennis from up-river.